This Nativity was designed by Joana Lekia Nelson, a former art teacher in Accra, Ghana. 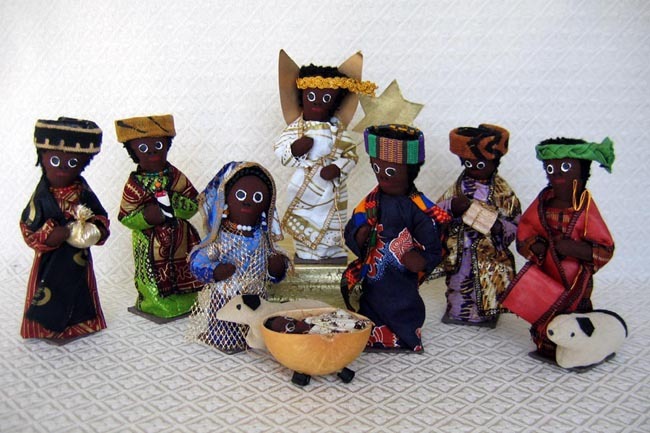 Joana used her design talents to combine traditional costumes and unique African fabrics into her doll Nativity sets. Each set she makes is handmade using local fabrics, paint, wood, cardboard and various other recycled items. Joana teaches girls seamstress skills in her shop who do not want to attend regular school, so the Nativity dolls were sewn by teenage girls. More than 60 youth have passed through her shop as short- to mid-term employees. Joana’s objective is to provide mentorship for youth, teach them a useful skill, provide an example of positive outlook and hard work, and help them save money to get more education or to open their own craft shop. The set includes 8 pieces: Joseph, Mary, baby Jesus in a calabash gourd with an attached sheep, a shepherd with attached sheep, an angel with gold cardboard wings and star, and three wise men with gifts. The wise men stand 7 inches tall.